Is there any financial decision more complicated, far-reaching and irrevocable than when to file for Social Security retirement benefits? There is an optimum filing strategy that will maximize lifetime benefits—and reduce longevity risk—for every individual or couple. But analyzing hundreds of scenarios to identify that strategy is dizzying. Take my situation, for example. My wife, Anna Beth and I are nearing retirement and the decision about when to claim benefits is upon us. As a contributor to WealthManagement.com, I’m considered an expert in financial matters. Still, I confess I’m bewildered by the complexity of determining the optimum claiming strategy for us. Retirement is not just an academic issue. 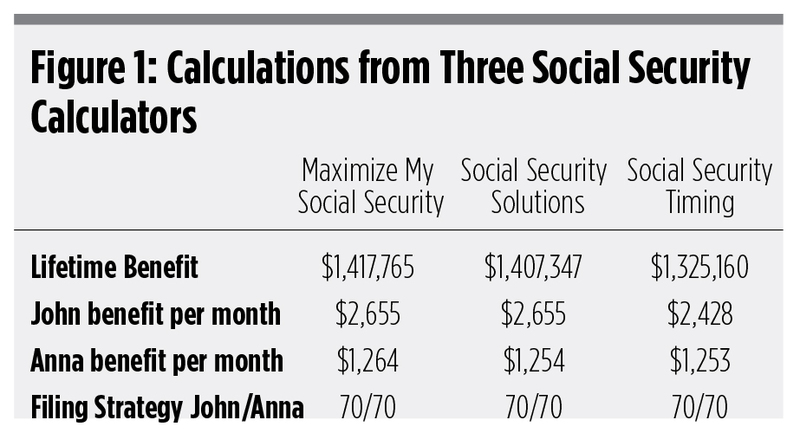 In this article, I look at how three Social Security calculators helped Anna Beth and I to identify the best decision possible for our situation using our actual earnings records. We are a good test case; I’m 67 years old, still working, and my wife is aged 65 and retired. Both of us are eligible to claim benefits, though have not done so. At the same time, our situation is more complicated than that of most clients. Anna Beth spent two-thirds of her career working for a state university system, paying into the state retirement system and not Social Security. Because she is drawing from a non-covered pension, her Social Security benefits are subject to the Windfall Elimination Provision. There are dozens of free and paid calculators. I put three commercial calculators—Maximize My Social Security (Economic Security Planning), Social Security Solutions (Social Security Solutions), and Social Security Timing (Covisum)—through their paces to test their validity (i.e., to see if they agree with each other on the calculation of our maximum lifetime benefit, plus the optimum filing strategy we need to take to get the maximum). There are, of course, many free calculators good for generating estimates, but they don’t make custom-tailored recommendations or accommodate a complexity like WEP (see side bar, Five Free Social Security Claiming Calculators). It’s not clear to what extent these free calculators incorporate changes from the Bipartisan Budget Act of 2015, specifically the phase-out of the file-and-suspend and restricted application strategies. Registering for the paid calculators is easy. A one-year license for Maximize My Social Security is $40. An additional $150 gets you a telephone session with an expert to go over your report. Social Security Solutions is $49.95 for a year of access; for $124.95, you get an interview with an expert. Covisum’s Social Security Timing is $49.99 per month or $500 per year. Covisum offers a 10-day free trial. All three calculators start with the advisor or client entering earnings information and some basic assumptions. Maximize My Social Security gets a nod for making this process a bit easier in that you can cut and paste earnings information from the My Social Security website page. The calculators from Covisum and Social Security Solutions require manual entry of the earnings data. The calculators allow the advisor to enter various assumptions about future earnings, income requirements, the rate of inflation, the real rate of return on investments and other factors. 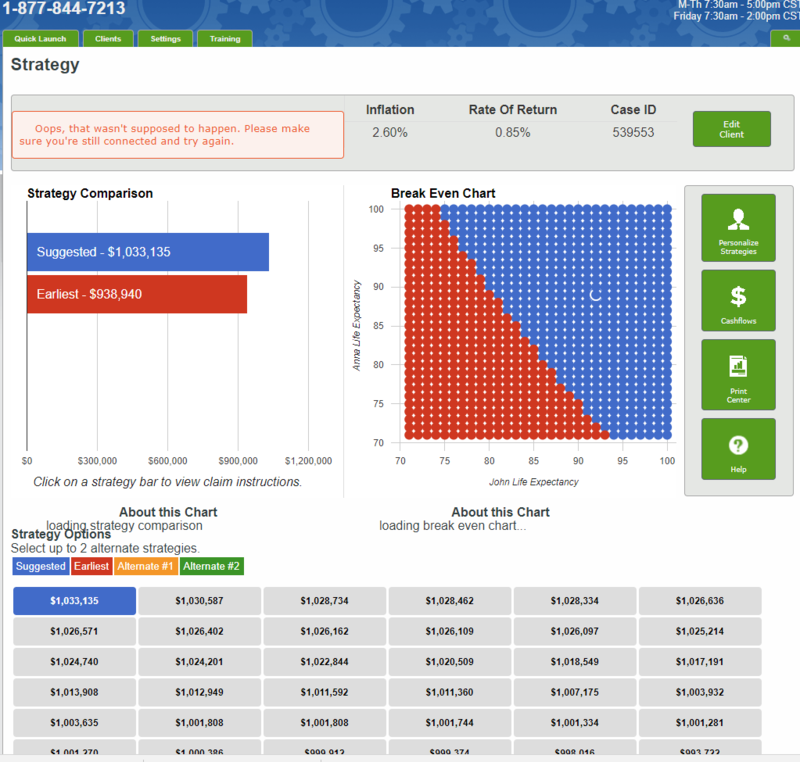 When all the earnings data is entered, each calculator analyzes hundreds of scenarios to generate an optimum claiming strategy. Each is optimized to find the strategy that maximizes the present value of the client’s lifetime benefits and reduce longevity exposure. The calculators allow users to compare the maximized strategy with any number of “what-if” scenarios, including early retirement, filing a restricted application, and, in the case of Covisum’s product, the withdrawal of application for those who have already filed for benefits within the past 12 months. First, I input the exact same earnings data directly from our Social Security statements. Insofar as I was able, I applied the same assumptions: For life expectancy, I used aged 100 for both of us; For inflation, cost of living adjustments, and earnings expectations, I used zero. How did the software packages compare in their calculations of my family’s maximized lifetime benefits, individual monthly benefits and optimum filing strategy to deliver those benefits? Figure 1 shows remarkable agreement. Maximize My Social Security calculated our maximized lifetime benefits to be $1,417,765 based on my wife and I receiving a monthly benefit, respectively, of $2,655 and $1,264. The software reports it examined 5,191 collection strategies. The optimum strategy it recommended calls for me to file a standard application for benefits in the month of the year I turn aged 70. It calls for Anna Beth to file in the month of the year she turns aged 70. Social Security Solutions calculated our lifetime benefit as $1,407,347. Our monthly benefits were calculated as $2,655 and $1,254. It recommended that we both file a standard application for benefits at aged 70. Social Security Timing calculated our lifetime benefit to be $1,325,160 based on my wife and I receiving a monthly benefit, respectively, of $2,428 and $1,253. It recommended we both file a standard application for benefits at aged 70. The calculators all agreed on the optimum filing strategy. The differences in lifetime and monthly benefits are probably due to a combination of the fuzziness built into Social Security Administration itself. In its calculation of a client’s benefits, the SSA projects one’s income into the future “at your current earnings rate.” That calculation of that rate can quickly inject discrepancies. While I tried to control for assumptions, the developers of each calculator must make various decisions about how to apply complex rules. Over a period of decades, small discrepancies compound. All three calculators considered the benefits of restricted filing strategies. Given that my wife’s benefits were subject to WEP, no restricted application scenarios were beneficial. When I ran our numbers without the factor of Anna Beth’s non-performing pension, each calculator recommended basically the same restricted application recommendation, guiding us to the exact month and year each of us should theoretically file. All three packages attempt to help the advisor guide clients through the tension between planning for maximum life expectancy and predicted life expectancy. Most clients are very concerned about “leaving money on the table” if they or their spouse should die early. All three programs produce reports and charts to identify the consequences of filing at different times. Covisum’s calculator generates a break-even chart that colorfully provides the best outcome for any given set of whole-year death-age combinations (Figure 2). Figure 2. The Break Even Chart from Covisum’s Social Security Timing Calculator. It should be no surprise that all three calculators favor waiting until aged 70 to file. For each year a client delays, benefits grow by about 8 percent with zero risk. There is literally no better investment in the world. Unless a client needs the benefits to survive or there is considerable reason to assume a low life expectancy, most advisors recommend waiting until aged 70 to claim. The real benefit of these calculators is that they insist on a pitiless, unsentimental analysis of life expectancy. These tools help the advisor change the conversation of retirees from expected life to maximum life expectancy. The tools help retirees understand that while they may call the Social Security checks they receive “benefits,” the payments are really a form of longevity insurance for which they have paid premiums all their working lives. The value of these calculators is to identify the maximum present value of lifetime benefits so that retirees avoid running out of money before they run out of life. For that reason, it’s usually the case that claiming smarter is equal to claiming later. Figure 3. Maximize My Social Security Compares the Maximized Strategy (black line) with Any Number of What-if Scenarios (orange line). It’s easy for advisors to overwhelm clients with too much information. These tools simplify an incredibly complex subject, but avoid making it too simple. The trick in all cases is not just to give clients customized advice, but to help them take action on it. The best tools make that as simple as possible.